Love from Florence: Interview, bracelets, and ... pizza. The tiny spike studs I ordered finally arrived today, all the way from China, so I made a woven bracelet with pale pink satin cord and spikes. 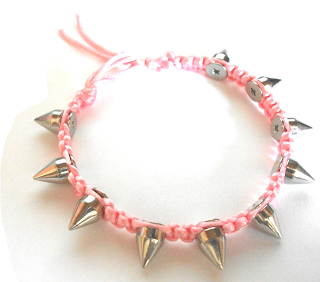 I am loving the combination of pastel colours and spikes. It's a really popular style at the moment, and very straightforward to make, so I'm going to make a few more and see how they do on Folksy. Later tonight I think John and I are going out for dinner on a sort of double date with our friend Andy and his on-off-on-on-off-on-off-nobody-even-knows-any-more girlfriend. We're going to Fire and Stone in Gunwharf for £4 pizzas. Hooray!